A decade spent developing pheromones for pest management underscored the importance of these chemicals for Michael Gilbert, president and CEO of British Columbia’s SemiosBio Technologies Inc. But at a cost of up to $5,000 a kilogram, pheromones are also one of the costliest pest control products on the market, making targeted deployment key to cost-effectiveness. Ideally, growers would obtain information directly from their orchards, by wireless transmission from traps that record insect activity by camera or other sensing device. Insect activity would trigger the release of pheromones at a critical time. Semios also works with precision control systems for bedbugs, but the challenge of developing agricultural applications turned out to be interference from the crops themselves. While digital information systems have fine-tuned growers’ understanding of many aspects of their operations, a simple barrier has long stood in the way of wireless technologies for orchards: the orchard canopy. Wireless networks operate at frequencies of 900 MHz and 2.4 GHz, and both are disrupted by the waves that leaves generate while fluttering in the breeze. As part of a consortium that also included the University of British Columbia, Okanagan Kootenay Sterile Insect Release Program and the University of Guelph, Semios received approximately Can.$10 million from Sustainable Technology Development Canada, a federally backed research foundation, to address the problem of canopy interference. 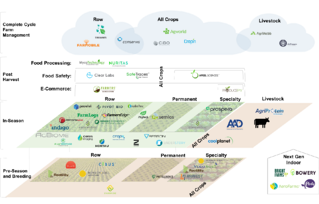 The company spent two and a half years working with 20 engineers developing a wireless network adapted to the specific conditions of specialty crops. The system operates on a combination of solar and battery power to transmit data, including climate data in and around the canopy, from the orchard to the grower. 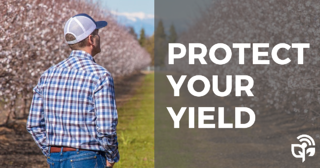 The presence of pests such as codling moth is tracked via traps equipped with cameras, which monitor activity and allow insect counts without physical inspection. A weather station is located every 100 acres, a trap every 10 acres, and pheromone puffers are distributed at a rate of one per acre. 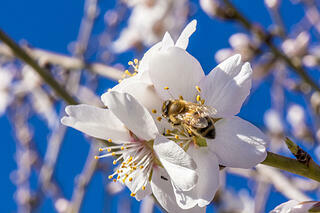 The data allow growers to fine-tune pest-control measures, such as pheromone releases. Semios provides the service to 50 growers in Canada, while Wilbur-Ellis Co. makes it available in the United States, where about 20 farms have signed on. More than 2,000 acres in Washington, Idaho, and Michigan subscribe to the service, at a cost of $150 an acre. The value to growers lies in the finer grain of information that emerges, and the promise of savings as pest management costs—both for labor and materials—drop. Pickel said this in turn promises to boost orchard productivity. 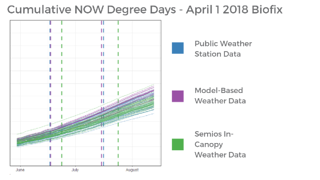 And make no mistake—growers will still have to head into the orchard, but Pickel said Semios’s system gives them a better idea of where to focus their efforts rather than having them spend time looking for trouble. According to Dr. Larry Gut and his associate Peter McGhee, besides wanting to see what insects land on their sticky traps, they want to know when they land. “We want to find out when insects fly,” Gut said. 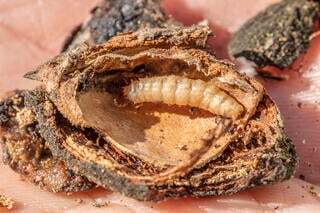 While a grower might use the system to detect when damaging insects first appear in an orchard, and thus may only need one picture every day, the researchers used their camera trap to take several pictures each day. “I’m trying to relate low temperatures and insect activity,” Gut said. “Most insects don’t fly under 60˚F.,” he said. So, when using aerosol puffers for mating disruption, for example, it makes sense to synchronize the emissions to the time of insect activity. Using the Semios system allowed them to make repeated observations of several traps without physically visiting them. Pictures were transmitted to the computer by cell phones connected in a repeater line-of-sight network. Using the Semios computer program, McGhee said, photographs of the sticky trap cards could be examined and insects on the trap “marked” by clicking with the mouse, McGhee said,. The sticky card could be viewed repeatedly, without having to physically scrape off insects counted previously. In their research, traps were located next to orchard weather stations so insect activity could be correlated to time, temperature, wetness, etc. Two companies offer automated lepidoptera monitoring traps, McGhee said. One is SemiosBio (semios.com/ipm/) and the other Spensa technologies with its Ztrap www.spensatech.com.